What Should I do if I break or lose My Retainer? As you are getting ready for bed, you notice that your retainer has gone missing. This is strange since you just wore it last night. Then you notice what seems to be a chewed up piece of it in the corner of your bathroom – looks like your puppy may have found a new chew toy. What do you do now? Is wearing your retainer really that important now that your braces are off? Your orthodontist in McMurray has answers. You have invested time and money into aligning your teeth and perfecting your smile. Now you want to protect that investment by wearing a retainer, which you will need to do for a lifetime. Believe it or not, without retention, your teeth will actually shift over time back into the position they were before you started orthodontic treatment. Wearing a retainer keeps your teeth properly aligned and ensures that you are able to enjoy your beautiful smile for a lifetime. Whether you break or lose your retainer, it’s important to contact your orthodontist right away to prevent any shifting of your teeth, which can happen immediately. Your retainer was made by using impressions of your teeth to create a plaster mold. You will need to return to your orthodontist to have new impressions taken and a new mold made of your teeth. The sooner you can do this, the better! It’s important that you clean your retainer daily. You can brush it at night or in the morning after you brush your teeth. You can soak your retainer twice a week in denture cleaner or Listerine to disinfect it. Be sure to store your retainer in a safe place, out of the reach of pets and away from heat. Don’t carry your retainer in your pocket, as it might bend or break. Instead, always use a hard case as storage and protection for your retainer. If you have any questions, or need to discuss replacing your retainer, contact your orthodontist right away to schedule an appointment. Dr. Gary Cartwright has been creating beautiful smiles in Southwestern Pennsylvania for over 20 years! With two convenient locations in Bethel Park and McMurray, patients in more communities have access to the confidence that properly aligned teeth can bring. If you would like to contact Dr. Cartwright, he can be reached through his website or by calling us at 724-942-5130. 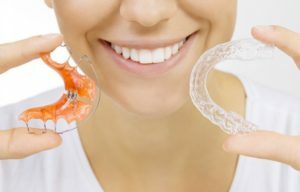 Comments Off on What Should I do if I break or lose My Retainer?